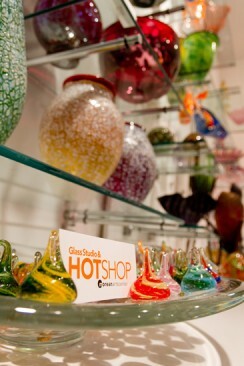 Visit our Hot Shop retail store for a wide selection of one of a kind art glass pieces. View and purchase the works of art that were created in the Hot Shop by our resident glass demonstration artists. Other glass pieces available in the retail shop are handmade by local glass artisans. There is something for everyone in the retail shop with gifts to fit every price range. Our friendly and knowledgeable staff will be happy to assist you in choosing a unique piece of glass or that gift for someone special. Gift certificates are also available for merchandise, Hot Shop Glass Blowing Experiences, art classes, annual passes and memberships. The retail shop is open Monday–Sunday from 12–5pm. Admission ticket is not required for store entry. We express our sincere appreciation to all those who support our programs and operations. The Morean Arts Center’s mission of Connecting People With Art would not be possible without you!